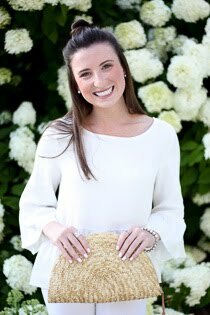 Faith and Fancy : Beach Beauty! I hope all of you New Englanders are surviving back up North! I think I picked the perfect time to scoot down south for a week - no blizards or sub-freezing temps for this girl. Thank God. A little dose of vitamin D, salt water, and sunshine are exactly what I needed, and I'm hoping I bring some of the warm weather back with me when I return home. Fingers crossed! In the meantime however, I plan on soaking up as much sunshine as I can in the little time I have left down here! If you need me, I'll be at the beach, which is something I do quite well. My perfect beach day is one that involves a full day lounging in the sun, a good book, and great company. You just can't go wrong with any of those! 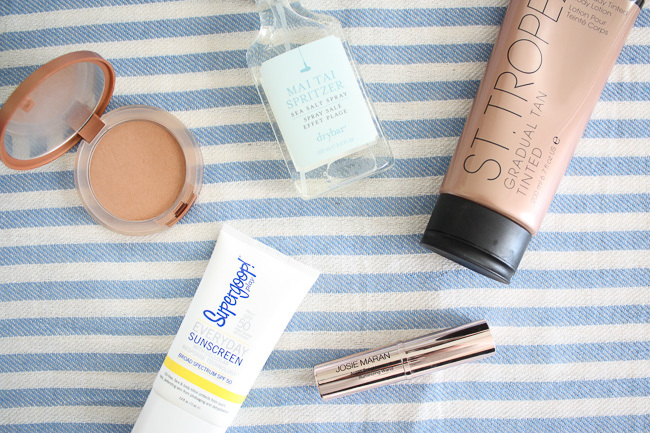 Of course, a full day in the sun, sand, and sea definitely switches up the beauty game a bit. There is no need for a full beauty routine, which honestly is pretty great. On the beach less is definitely more, and there is honestly nothing better than a break from a full face of makeup and styled hair! 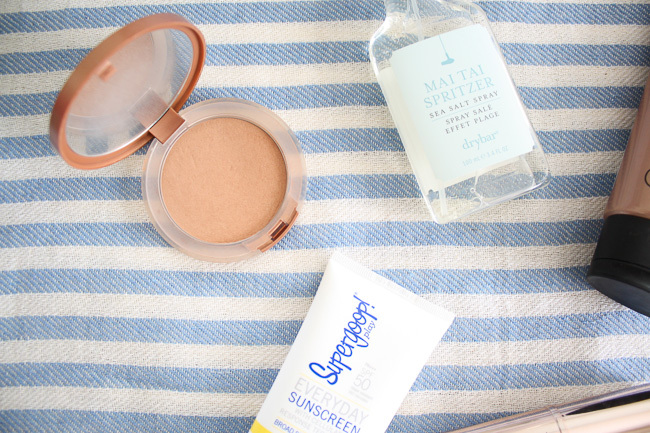 Having spent the past week on the beach, I wanted to share some of my go-to beauty products for seaside vacations. 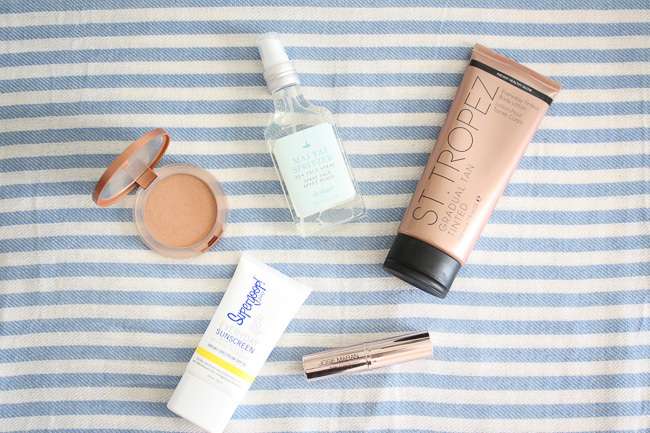 These are all products I use and love, and come summer they are definitely some of my go-tos. 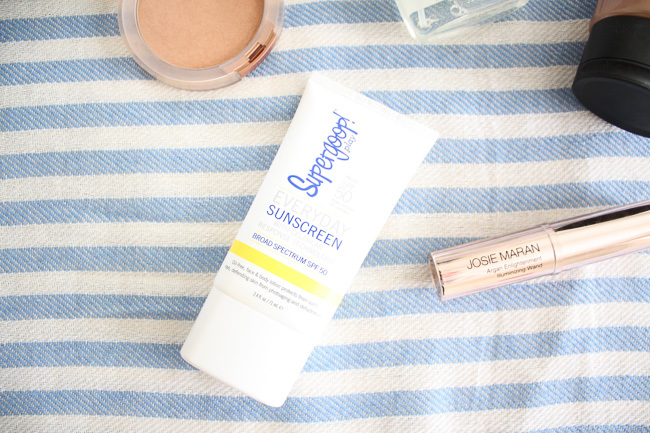 Sunscreen is obviously a must have and I'm loving this Supergoop everyday sunscreen. 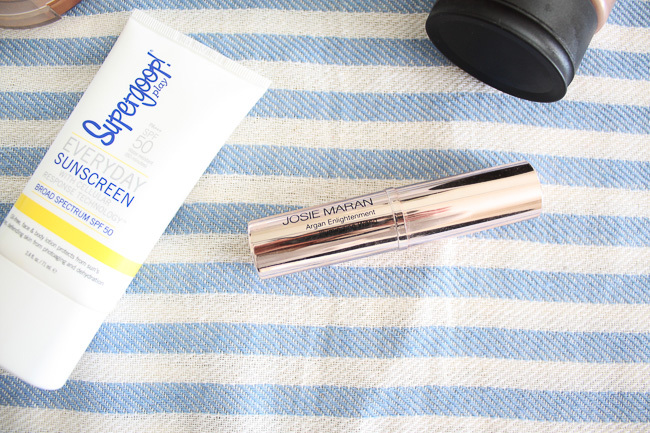 It's lightweight and non-greasy which are two essentials in my book for face sunscreen. 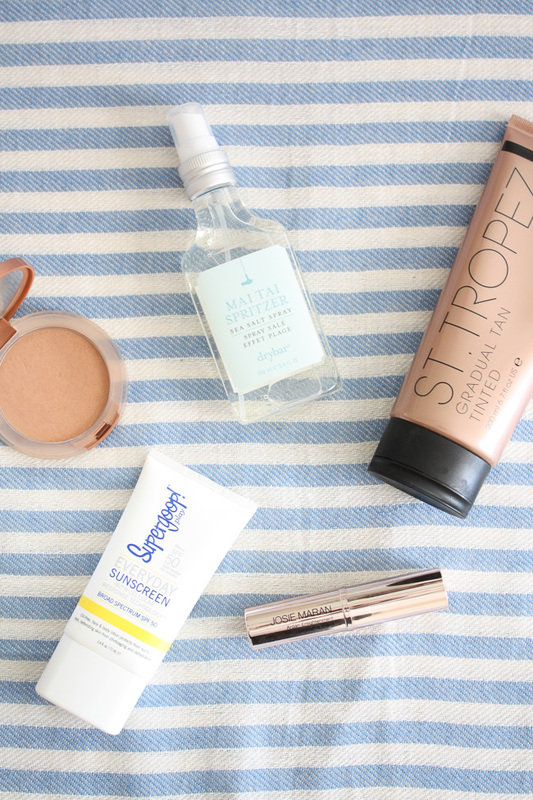 For that oh so desirable beachy glow, I always can rely on St. Tropez tan lotion and this Clinique bronzer. 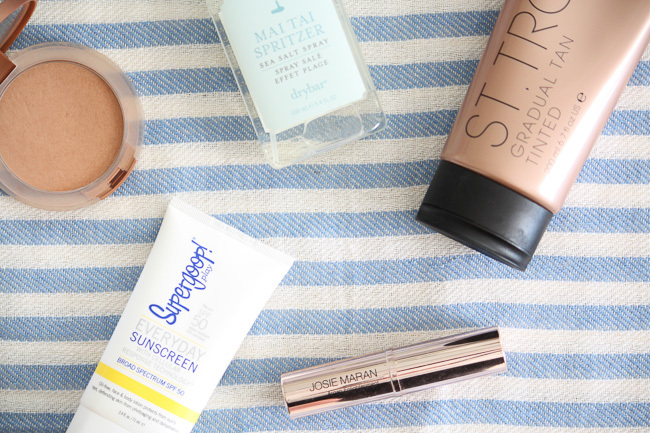 Both create a natural bronze glow. 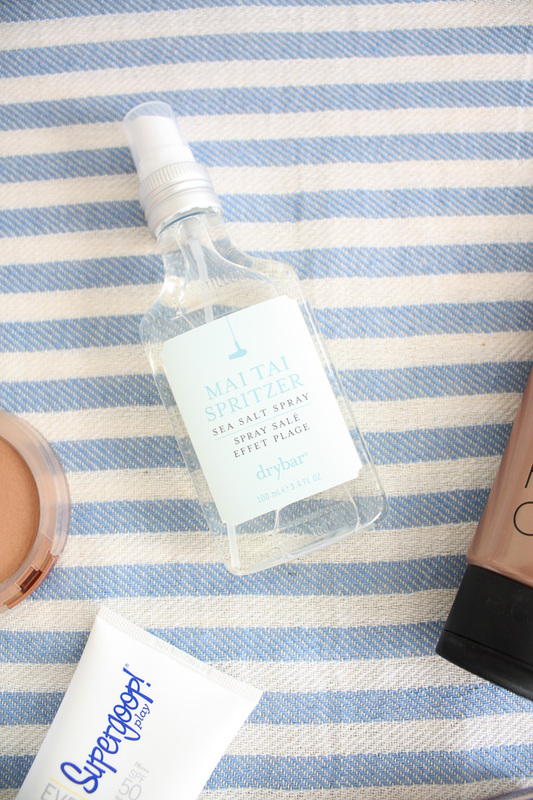 As far as hair goes, DryBar's mai tai spritzer give you beachy waves that are just about as good as the real thing, but smells amazing. To shop all of my favorite beach products check out all the links below! Enjoy!